Hello again to all my faithful friends and followers. Mr. Frankle gave me the review I told you about last Monday. I really appreciate it. Have you added your email address to the "Subscribe" box on my Blog's sidebar? It's a great way to keep up with what I'm doing and how, plus all my blog entries. And when I finally finish my next novel, I'll be sure to let you know. Speaking of reviews, here is a link to the reviews I've gotten 9 so far from various people: http://www.amazon.com/dp/1680583093/ref=cm_sw_su_dp. You'll have to scroll down a bit to find them. I just met someone on line who wants to give me a review too. 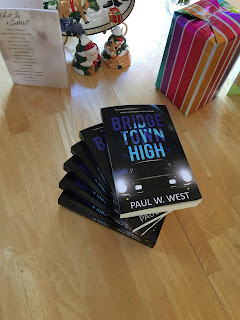 If any of you want to review Bridgetown High in exchange for a free Kindle copy, let me know, either here on my blog site or on my Facebook page at: https://www.facebook.com/Paul-West-Writer-284357001596275/. Next week I'm thinking of posting some tossed out chapters of Bridgetown High. Until then, thanks for your following.